There are two ways I roll when making dinner: I lazily choose an entrée that is in my regular rotation (e.g. 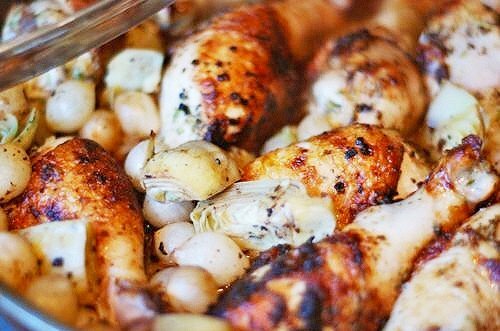 Damn Fine Chicken) or I pick a new dish to try. That means there are lots of dishes I only make once, even though many of them would make my greatest hits list if I’d just repeat and tweak. 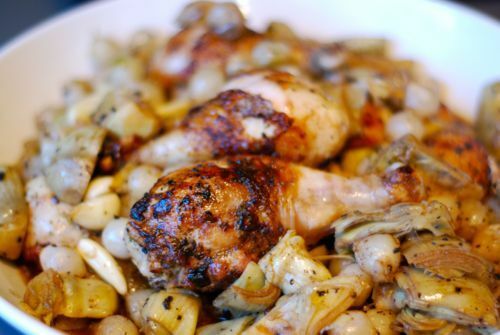 So in an effort to expand my list of go-to entrees, I remade and modified my braised chicken thighs/drumsticks with artichokes and pearl onions recipe. 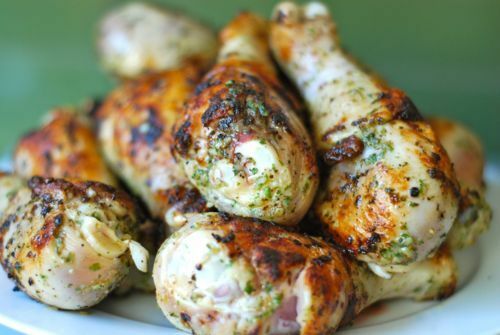 The main alteration I made in the recipe was pre-seasoning the chicken with Sunny Paris, salt, and pepper and letting it chill in the fridge for several hours before baking it off. 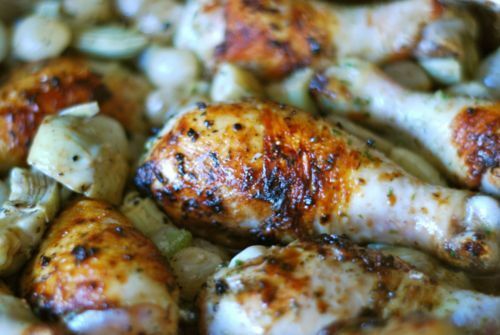 This simple, extra step makes this dish another winner, winner, chicken dinner! Please note you can adapt this recipe to fit whatever is in your crisper: change the veggies (e.g. mushrooms & onions, carrots & leeks etc.) and/or toss on some fresh herbs at the end. Follow the jump for the new and improved version! 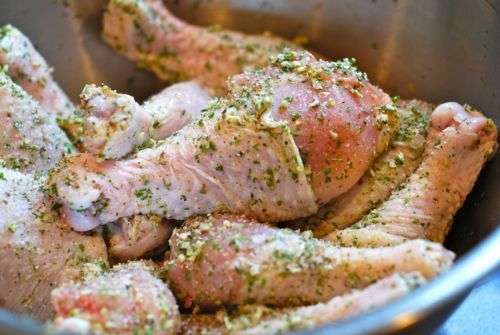 In the morning, I dumped the chicken in a bowl and tossed it with Sunny Paris seasoning, two large pinches of salt, and a few cranks of black pepper. I placed the bowl in the fridge for 8 hours (marinate for a minimum of 1 hour). 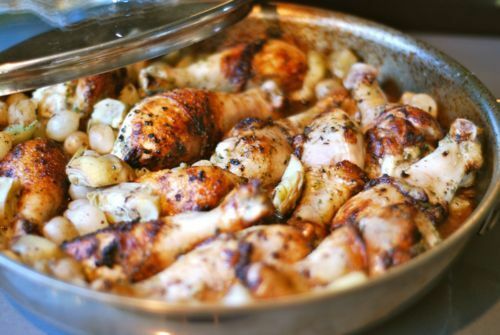 When I was ready to cook the chicken, I preheated the oven to 325 F and I melted the ghee over medium-high heat in a large 12–inch oven-safe skillet fitted with a lid. I fried the drumsticks in two batches until they were browned all over. 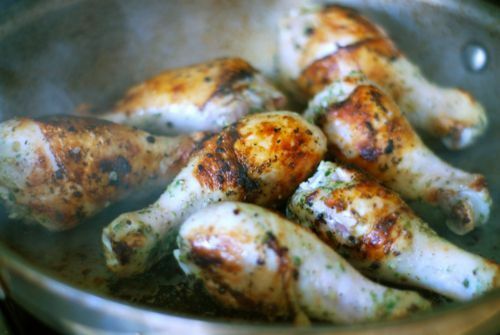 Don’t overcrowd them or the chicken will NEVER brown properly. 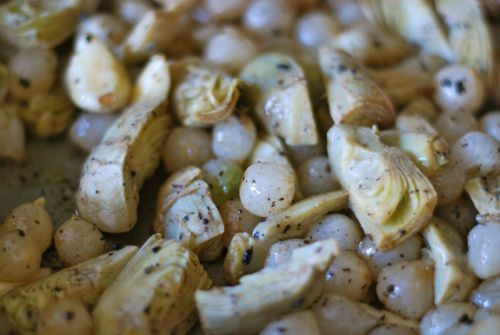 …and threw in the frozen onions, artichokes, and garlic. …and sprinkled on the vinegar. I brought the sauce to a boil, put on the lid, and popped the skillet in the oven for 45 minutes. …I tasted for seasoning and plated it up. This entrée has definitely made it off the B team!